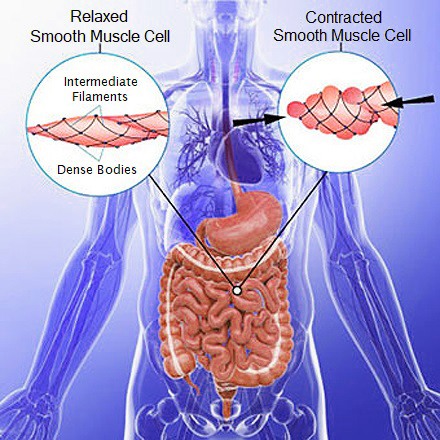 Smooth muscle cells (SMCs) are found in the walls of various organs, including the uterus, bladder, gastrointestinal tract, blood vessels, and more. They are the force behind the contraction of these organs. In particular, in the uterus, they are involved in expansion and contraction of the uterus during pregnancy and childbirth; in the bladder, they drive urination; in the gastrointestinal tract, they propel peristalsis; and in the blood vessels, they control blood pressure and flow. These SMC properties are mediated by actin and myosin, which together use cellular energy to generate contractile forces, enabling these organs to operate properly. As with any cellular system, disruption of SMC function can result in disease, including cardiovascular disease, which is discussed below. Lifeline® SMCs are optimized for growth in VascuLife® SMC Medium and can be used to study angiogenesis, atherosclerosis, diabetes, and cardiovascular biology. Lifeline® SMCs are never exposed to phenol red. Diabetic cardiomyopathy is a significant complication resulting from diabetes. It is thought to develop following adverse changes to the vasculature, including reduced microvasculature. This in turn, can lead to an increased likelihood of cardiovascular events. Cardiovascular angiogenesis (the formation of new blood vessels) is regulated by neuregulin 1 (NRG-1) signaling through the ErbB tyrosine kinase receptor family (which includes the epidermal growth factor receptor [EGFR]). Previous research has demonstrated that NRG-1 expression and ErbB receptor phosphorylation levels are decreased in diabetes. Given these observations, Gui and colleagues published a recent study that examined the effects of NRG-1 on angiogenesis in the context of diabetes. Using a rat model of diabetes (induced by streptozocin [STZ] injection), the authors first demonstrated that diabetic rats experienced decreased left ventricular function, capillary density, and myocardial blood flow. They found that NRG-1 treatment via tail vein injection significantly improved both cardiac function and capillary density. Next, the authors investigated how angiogenic signaling was affected by NRG-1. They found that in diabetic rats, NRG-1 treatment resolved attenuated expression of vascular endothelial growth factor (VEGF) and angiopoietin-1 (Ang-1), two growth factors important for angiogenesis. Additionally, NRG-1 treatment of diabetic rats increased the reduced phosphorylation of ErbB2 and ErbB3, and of Flk1, and Tie2, receptors for VEGF and Ang-1, respectively. Finally, the authors used Lifeline® normal human coronary artery cells (HCASMCs) in vitro to determine how NRG-1 affects expression of VEGF and Ang-1, which are secreted from SMCs to regulate angiogenesis through Flk1 and Tie2 on endothelial cells. The researchers grew HCASMCs in hypoxic and serum-deprived conditions to model diabetic ischemia (a condition of reduced blood supply to the organs). They found that NRG-1 stimulated phosphorylation of ErbB receptors and upregulated expression of VEGF and Ang-1 in an ErbB-dependent manner. Together, the results of this study demonstrate that NRG-1 can improve angiogenesis in the context of diabetic cardiomyopathy, representing a potential therapeutic approach to improving cardiovascular health in patients with diabetes. Atherosclerosis is a significant risk factor for cardiovascular disease, which kills more people each year than cancer. Although various genetic risk factors have been identified, they do not account for the full spectrum of disease causes. In particular, it is becoming clear that epigenetic regulation of gene transcription is a significant contributor to atherosclerosis development. In a 2018 study, Xia et al. performed RNA-seq and raw DNA methylation analysis of carotid artery samples from patients. They found significant epigenetic differences between healthy controls and atherosclerotic samples, including up-regulation of 174 genes with hypo-methylated promoter regions, and down-regulation of 86 genes with hyper-methylated promoter regions. Of the differentially regulated genes, the authors found that SLAMF7 was up-regulated in atherosclerotic samples, and in particular, in macrophages. Using a graded set of atherosclerotic plaques from patients, the authors found that SLAMF7 protein expression was more highly expressed in unstable plaques than in stable plaques. By examining cultured monocytes and macrophages isolated from patient atherosclerotic plaques, the researchers demonstrated that stimulation with lipopolysaccharides (LPS) stimulated SLAMF7 transcript expression, and SLAMF7 knockdown reduced a number of pro-inflammatory cytokines, including IL-6, IL-8, IL-12, and TNF-a. Finally, the authors used Lifeline® human aortic smooth muscle cells to demonstrate that stimulation of SMCs with conditioned medium from macrophages and monocytes with intact SLAMF7 expression inhibited SMC proliferation. In contrast, conditioned medium from macrophages and monocytes lacking SLAMF7 mostly restored SMC proliferation to normal levels. Together, this study illustrates that differential epigenetic regulation occurs in atherosclerosis. Importantly, SLAMF7 expression promotes the production of pro-inflammatory cytokines and prevents SMC proliferation, all of which contribute to the pathogenesis of atherosclerosis.